As per the other comments I would say that 95% of the customers are German in the hotel and around the resort. The rooms are truly massive, we have visited many 5* hotels around the globe and never had a room as big as this. The only downside is that the only English TV channels were BBC world news and British Eurosport, so there is basically no entertainment via the TV. The food is very good but if we stayed again it would be on a breakfast only basis. Breakfast consists of fruit, pastries, cheese, cereals, cold meats, eggs, spicy fried sausages, streaky bacon, fried 'spam' slices, many different types of bread and rolls, juices, various loose leaf teas and coffee - the selection is massive and you will not be disappointed. The dinner deserts look fabulous but just taste sweet - the ice cream was the exception and is rather good. One thing we found rather odd is that there is no room service (apart from a breakfast service). Whatever sitting you choose, it is best to go for dinner at least half an hour after the sitting commences as if you go at the start you will find that the chefs are still cooking some of the main courses. Lunch in the hotel is best avoided - expensive and only average at best - I had a chicken curry and it came with green beans and brussel sprouts! Visit the local Netto for you lunch time supplies (it isn't like Netto in the UK, more like a Tesco). Hotel staff are very friendly as reported. Agree with all the good points. Beware this hotels still allows smoking in their entertainment area! If you want to smell like an ash tray, this is the place for you. We have just returned from this lovely hotel in Jandia, a first visit for us to a Riu Hotel, and I don't think it will the last. From check in to leaving we really haven't got a complaint to make. The rooms were enormous spotlessly clean to a very high standard everyday. The seating area had a double sofa bed which was converted to accommodate our son. Our standard room directly overlooked the pool and sea. There was complementary half bottle of sherry, water and basket of fruit on our arrival in the room. We are not particular fans of half board but on this occassion we were not disappointed. The food is of a very high standard and even after two weeks we were not bored of the selection on offer. The restaurant is very pleasant, and the staff are extremely efficient. We were a little disappointed that we couldn't choose dine whenever we wanted, it was either a 6.30 or 8.30 sitting. We couldn't drag ourselves away from the pool early enough to make the 6.30 sitting so 8.30 it had to be. The location was perfect for us in between the slightly commercialised Jandia, and the pretty town of Morro Jable, both only a few minutes walk away. The hotel caters for predominately for German guests, then Spanish, then the British, but we didn't find any problem with this. Its not a hotel which offers great facilities for children, our 9yr son however was more than happy with the pool and spa, and the beach. The hotel is built on the side of a hill, there is absolutely nowhere you can go without climbing stairs here so not suitable for those who have mobility problems. It kept us fit though throughout our stay! We are not fans of hotel entertainment so can only comment on the resident band that played on the terrace a couple of times each week, pleasant enough but after the fourth time of hearing the same set over two weeks it was a little tiring. Would definitely make a return visit to this hotel. This was our first visit to the Riu Palace. The hotel is located at the far end of Jandia near to the old town of Morro Jable. There is a lovely promenade in front of the hotel that leads to Morro Jable, well worth a visit both day and night. Jandia is more touristy and is about 10 minutes walk away, here you will find plenty of bars and restaurants. The hotel is located on fantasic beach, the views from the pool area are breathtaking. Rooms - very large, they have a separate dressing area, the ladies will love it, good a/c, TV, fridge, plenty of plug sockets, large bathroom, they are truly luxurious. Maid service is daily and I couldn't fault it. Food - the selection is vast and is of very high standard, I'm a fussy eater and I couldn't fault the food. Service - excellent service throughout our holiday, we were made to feel very special by all of the staff. Pool area - very clean and there is small pool bar. You can also dine by the pool area during the evening. The only downside to this hotel are the number of steps. We booked a standard room, however, they have a lateral sea view which was very good. We thought the hotel was more suited to couples, however, there were a few children present and they were made very welcome. Everything about the hotel and it's staff oozes professionalism and service of the highest standard. We will return for our silver wedding anniversary next year. It isn't cheap but it's worth every single penny. The Rui Palace Jandia is set right on the beach between the lighthouse and the small town of Morro Jable. It is only a few minutes walk to the nearest shopping centre and supermarket. We were offered free champagne or fresh orange juice on arrival whilst our cases were taken to our rooms. The Reception area is beautifully light and airy with a glass roof and marble floor. Our bedroom was huge, with two adjacent four-foot beds covered with gold bedspreads to match the gold curtains and blue and gold carpet, a seperate living section with a sofa, armchair, coffee table, writing desk and fridge and a fabulous view along the beach to Morro Jable and the mountains in one direction, and along the beach to the lighthouse in the other direction. The dining room had peach coloured walls and columns, with beautiful crystal chandeliers. Everything was spotlessly clean and the staff were all so polite and friendly, always a "Hola" or "Buenas Dias" from the maids and waiting staff to the Manager who personally greeted each guest as they went in for dinner. The food was fantastic. You could choose to eat from a set menu and be waited on, or you could help yourself to the buffet. The quality of the food was superb. There was such a choice - smoked salmon, langoustines, even unlimited fillet steak on some nights. There was also a small section of children's food for the few children staying in the hotel. There was little in the way of entertainment. A pianist played every night in one of the bars, and a band sang old fashioned songs (My Way, Delilah, and Rose Garden) in the other bar which had a dance floor. After two nights of this, we asked if they could do anything more modern or faster, and they came up with Dire Straits' "Walk of Life" so we got up and had a dance. One night we had a Bee Gees Tribute Band which was quite amusing as they obviously didn't understand the words they were singing, and on another night there was a very enjoyable Argentinian themed evening with superb dancers doing tangos and other flashy dances. There was absolutely no entertainment or any other amenities for children and I would not recommend this hotel for anyone with children as the majority of guests were German and over 50. It was a very quiet and relaxing place with affluent guests wanting - and getting - the quality and service that they could afford. 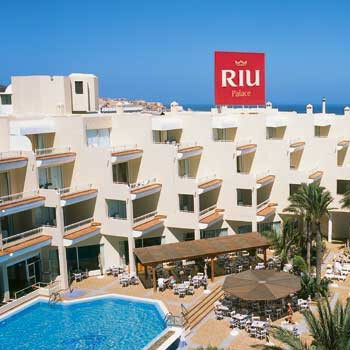 We would certainly go back, and because of the high standards we will also try other Riu hotels. We have stayed in other four and five star hotels in the last year or two, and this has been the best. The hotel food was wonderful. I just loved to eat there and I regret not having a full board. Lots of tasteful vegetables and fruit, besides meat, fish etc. The breakfast was also great, I still remember the all wheat bread I used to eat there. Wonderful juices too. I also loved the location. It's near the beach and you can go from the hotel to the beach using the hotel acess. The water in the beach was warm and I did't want to get outside. You can remove the sand in your body in a shower near the hotel door that acesses the beach. The pool inside the hotel is great too and you don't have any towels issues there. You have a jacuzzi on the left, which usually doesn't have anyone inside. It's true that the staff says "hello", and "hi" when you pass by, which makes you feel very welcome. Regarding entertainment, I didn't notice much...just in the bar. You can play tennis table and go to the gym and also you can use the internet (this last one is paid).